Industrial Data Xchange: Siemens S7 PLC programmer and communication interface. Siemens S7 PLC programmer and communication interface. The NETLink PRO Compact can be used as a programmer for an S7 PLC and/or as a PC interface. 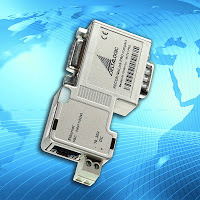 The device is packaged inside a conventional Profibus plug, and has a direct Ethernet port connection. The device supports MPI, PPI and Profibus, and automatically detects the correct communication used by the PLC. Remote logging: Access your PLC data over the internet. Configuration of the NETLink PRO is done via its integrated webpage.